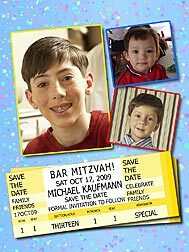 Why settle for ordinary bar mitzvah or bat mitzvah favors, when you can give photo bat mitzvah or bar mitzvah magnets to your guests?! These beautiful 2 x 3 inch and new 3 x 4 inch photo magnets contain a professionally reproduced photo of the bat mitzvah girl or bar mitzvah boy, along with your personalized message. They are much more than bar mitzvah or bat mitzvah favors, they are memorable photo keepsakes everyone will treasure! Also available for b'nai mitzvah. Great save the date idea! Email us 3 of your favorite photos & personalization. Only available in 3x4 inch size. Email us 2 of your favorite photo & personalization. Email us 4 of your favorite photos & personalization. New 3 x 4 inch photo magnets. Your photo is imprinted onto an ultra-thin, flexible, glossy magnet material (superior 16 ml thickness) for a photo finish. Messages on above bar mitzvah and bat mitzvah photo magnets are only suggestions. You may change the wording to create your own, personalized message. Look at the sample text used in the magnet of your choice as a guideline to how much text can be used for personalization. 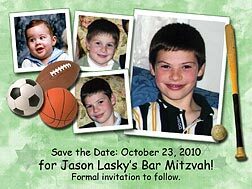 We always email you a proof of your bar mitzvah or bat mitzvah photo magnets favors order within a couple of days of receipt, so that you may check it for accuracy, and we only send your order to production after we have received your approval. 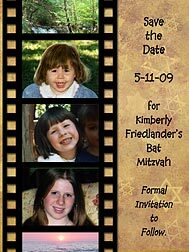 Sample of a past Jewish wedding, bat mitzvah or bar mitzvah photo magnets favors order can be obtained if you send an SASE with $2, which will be refunded (minus postage) with your next order. You may specify which design sample you wish to receive. We also have photo bat mitzvah and bar mitzvah save the date cards available, which include your multiple photos and personalization. 2 x 3 inches $2.00 ea. $1.75 ea. $1.50 ea. 3 x 4 inches $3.50 ea. $3.00 ea. $2.50 ea. 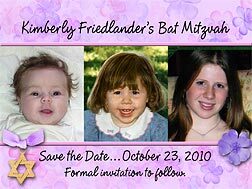 EMAIL your high resolution jpg photo (or photos, if the design requires more than one) for bat mitzvah, bar mitzvah or Jewish wedding photo magnets to PhotoPartyFavors@aol.com. Please include your name, shipping address, phone number (in case we have any questions), what you're ordering, how many, the last possible date you need it by, the personalization desired, and confirmation that you have mailed (or will be mailing within the next 24-48 hours) your check made payable to Linda Kling. bat mitzvah or bar mitzvah? 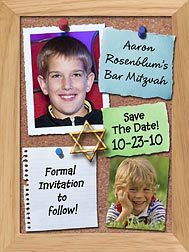 We also have Photo Bar Mitzvah & Bat Mitzvah Save the Date Cards available. Any questions or comments about our bar mitzvah or bat mitzvah photo magnets or any of our photo party favors? Send us an e-mail at PhotoPartyFavors@aol.com. You can also check our FAQ page for answers to common questions.